A decade ago, Fat Toad Farm started out as a simple experiment in homesteading. Calley Hastings and her family hand-milked a French alpine doe named Jupiter in their Brookfield garage to make goat’s milk caramel sauce for friends and to sell at the local farmers’ market. Back then, the family never dreamed they would one day be producing 18 gallons of caramel per day to sell to across the country. These days, Fat Toad Farm—founded by Calley, her stepfather, Steve Reid and mother, Judith Irving—is an award-winning food business that specializes in the production of goat’s milk caramel sauce, based on the traditional Mexican confection, known as cajeta. The store at Fat Toad Farm in Brookfield. On a dirt road in Orange County in the same house they’ve owned for 30 years, the family has built a small specialty food empire with little formal training. Their recipe for success? Hard work, good timing, and a commitment to using fresh, all-natural ingredients. Fat Toad’s line of tasty flavors, which are researched and developed by Calley, include salted bourbon, cold brew coffee, spicy dark chocolate, vanilla bean, Vermont maple, and cinnamon. A tiny, makeshift store at the farm is stocked with jars of caramel sauces to purchase and samples to taste. You’ll also find recipes, an email sign-up sheet, and an early sketch of the Fat Toad Farm logo by New Yorker cartoonist and fellow Brookfield resident Ed Koren. Until recently, Fat Toad Farm kept a herd of 75 goats—with names like Puff, Apollo, Tulip, and Rascal—on its four-acre property and produced milk between March and November. The herd was recently sold and relocated to Ayers Brook Goat Dairy in Randolph, which opened in 2013 by Vermont Creamery. As the country’s first demonstration goat dairy, Ayers Brook Goat Dairy serves to develop and model best practices in dairy goat herd and feed management, with the goal of spurring the growth of the dairy goat industry in Vermont. 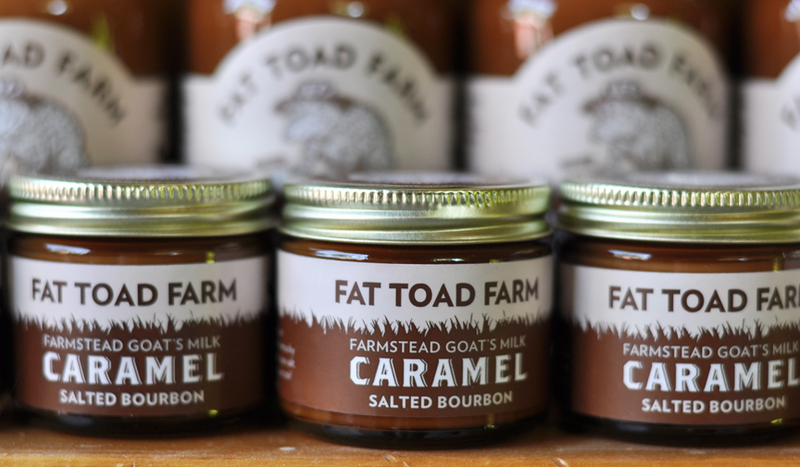 The new partnership with Vermont Creamery also allows Fat Toad to source a year-round supply of fresh, local goat’s milk and support the increasing demand for their goat’s milk caramel sauces. Calley believes the new partnership will ultimately help Fat Toad Farm grow its business in the specialty food market. **If You Go: Fat Toad Farm is located at 787 Kibbee Road in Brookfield and includes a small onsite, self-serve store to purchase products (no tours are available). You can also find Fat Toad caramel sauces at City Market, Healthy Living, Hunger Mountain Co-op, and other locations, or order directly online. For more information, visit www.fattoadfarm.com.